This article examines how the Fantasy managers that sit in the top 10,000 (at the point of the Gameweek 30 deadline) are shaping up ahead of Blank Gameweek 31. Studying the most-owned players in Gameweek 30, seven of the “template team” are without a Premier League fixture next weekend. Aaron Wan-Bissaka (£4.5m), Matt Doherty (£5.4m), Paul Pogba (£9.0m), Son Heung-min (£8.8m), Raul Jimenez (£6.9m), Sergio Aguero (£11.9m) and Marcus Rashford (£7.7m) blank in Gameweek 31 due to the clash with the FA Cup quarter-finals. 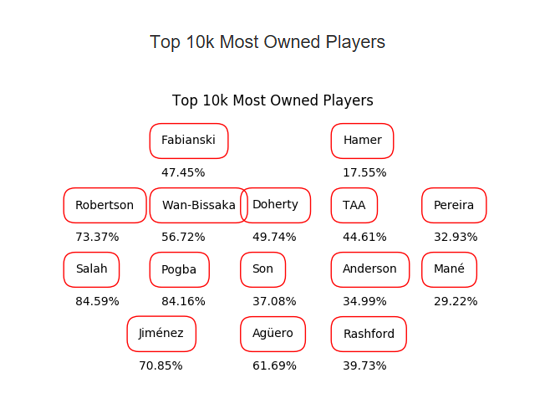 Doherty, Wan-Bissaka, Pogba, Jimenez and Aguero are each owned by around 50% of FPL managers or more in the top 10,000. 11.2% of the top 10k own all five of these players. As the graphic below shows, three of the four clubs with the most representation in the top 10k are without a Premier League match in Gameweek 31. The combined average number of players just from Wolves, Manchester United, Manchester City and Crystal Palace in the top 10,000 FPL squads is 5.3, suggesting there are plenty of these elite managers who aren’t yet in a position to field a full complement of Fantasy players in Gameweek 31. 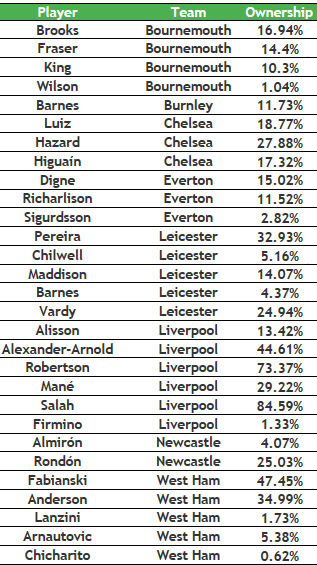 43.5% of FPL managers inside the top 10,000 have all four of their chips – Wildcard, Free Hit, Bench Boost and Triple Captain – still available, as the below graphic shows. 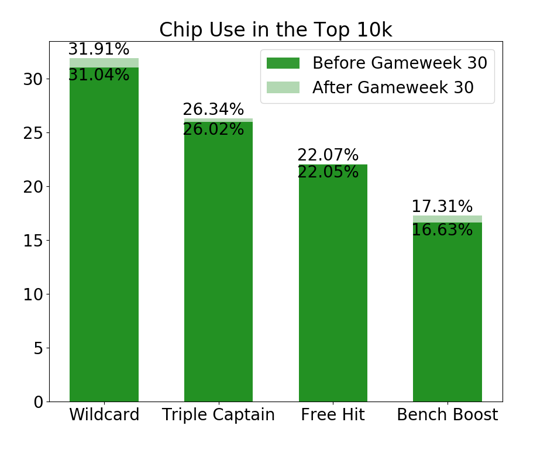 Over 25% of the top 10k have already used two or more of their chips going into Blank Gameweek 31. 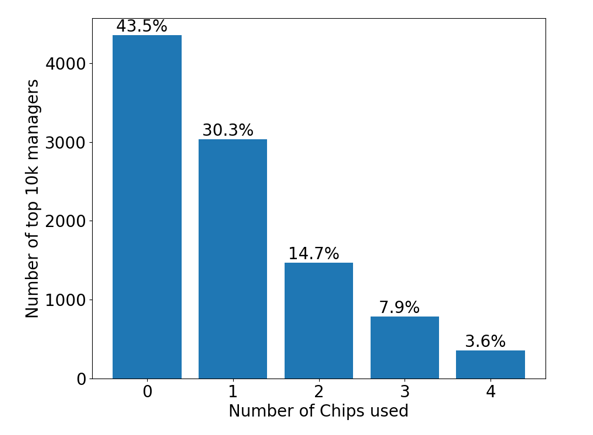 The breakdown below shows which chips have already been used by our leading FPL bosses. Almost 32% of the FPL bosses inside the top 10,000 have already used their second Wildcard, while 2,207 of these managers will have to navigate the weeks ahead without their Free Hit chip. More than one in six of these managers have already deployed their Bench Boost chip. 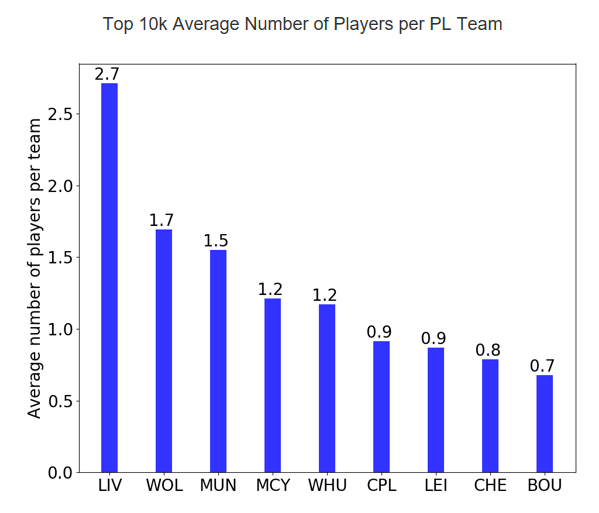 The below table shows how well-owned this cherry-picked selection of players are among the top 10,000 FPL managers. All of these Fantasy assets have league fixtures in Gameweek 31. 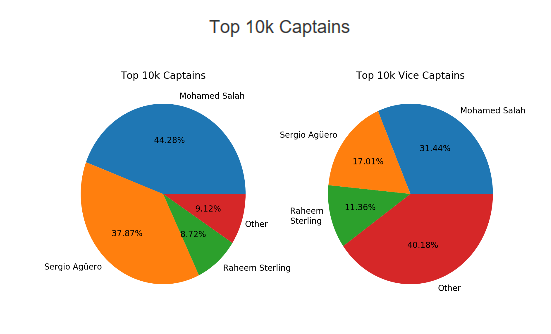 We have focused mostly on Gameweek 31 in this piece but the below graphic shows the spread of Gameweek 30 captaincy picks within the top 10,000. Almost 9% of the top 10,000 managers look primed for a rank hike after Raheem Sterling‘s (£11.4m) hat-trick on Saturday evening. You can view more Gameweek 30 stats on Ragabolly’s site here. Holy moly, wasn't expecting all of those rises. Only 2 drops, not bad. I though Brooks was injured. Obviously not. thoughts on sterling + pva > hazard + luiz/ azpi (-4)? Most transfers are worthwhile this week if FH32. would you go a step further, take a -8 and field 11 then? You take them in normal gameweeks so you know. First year on here and was flying. Top 1.5k at highest point but used my WC first half of season stupidly and didn't jump on bandwagon of Son and Pogba early enough. Now sit at 70k with all Chips left. No experience on what to do so kind of following crowd, learning curve I guess? Yeah . Luck plays a big part of it too. Yes when you have so many talking fantasy all day every day people lose the power of thinking for themselves. I forget what it's like to make my own decisions. It's like a cult . You can check out anytime you like but you can never leave. Jokes are frowned upon. Way too serious on here to be joking. Luck is bigger than most think. No goal to Sterling and who knows if he gets any returns. Just seen it . That should never have counted but as a sterling Aguero owner I'll take it. You’ve done the right thing in holding onto all your chips. All will become clearer in the next few GWs. Follow the crowd for a third of your team for the rest of it try and be more creative. Look at the third/fourth options from the teams you are considering. You are not alone in that great drop. I noticed even from listening to the podcasts people can become rigid in thier choices, particularly if they are in a group. It is hard to explain but you have to take sensible risks consistently to do really well (I have rarely done that - no patience at times). Think ahead of the next likely flavour of the month before it happens - hard thing to do. Then you have to force yourself to get rid of some players that have served you well. I have never been as pleased and annoyed at the same time after a gameweek. Last gameweek I TC'd sterling against a weakened Bournemouth side after getting him in specially - against the grain despite having a blank soon. Thought it was better using the TC than this week because of Bournemouth injuries - and 'open' Bournemouth style. I got a whole three points X3. But this week I kept the armband on sterling . At least you captained him this week. Yeah I suppose, better then another blank! There will be no whinging out of me if Salah blanks, my main tactic for a good jump in rank was spreading Salah funds and going mane - liverpool double defence.. I did same. Salah to Sterling last week.captained him last week but not this. Got Mane for Son so need him to beat Salah tomorrow. Not confident of it though. Think Salah could go big. I am still fairly confident Mane will outscore Salah in the next two games - he looks very lively. Would you even have TC'd him this week though or saved it for another player in another game? Most likely I would have - it was either this gameweek or last gameweek, because of the way the free hits / WCs are likely to fall the free hit 32 tactic etc. I understand the frustration of course, I had Sterling and Aguero in the double GW, was always using TC on one of the two and chose the wrong one. I did think of those poor souls who TC sane recently for the DGW my consolation was at least I got 3 points. I wouldn't mind, but last game-week there were posters discussing the TC chip on sterling. The Bournemouth injuries swayed me - and a definite starter was rested etc. But another poster said sterling TC v watford would be a better choice. I can't remember who it was but he/she was - but was bang on. I suppose over the last two captains choices I made it leveled out in a sense. Would have been chuffed with 9 x 3 - or thereabouts for TC. Thought you said you were Triple Captaining? Best Saturday of the season. 84 from 5 and hoping for 110-120 and highest single gw score. Team had been going down the toilet until bit the bullet and wc last week. Top 100k back in reach. That is some jump 400k ish places. Still have lots to play as you say. You must have felt you were stuck in the fantasy mud for a while. This is your shawshank redemption! Sterling to Hazard (-4) if pursuing the FH32 WC34 strategy? I lose 0.2m on Sterling when I get him back in 34 (though perhaps he will fall before then). Sterling to anyone will be popular this week. Well the alternative is just playing with 10 this week or trading Doherty/Pogba instead. Guess it depends on what it costs you to get him back. Sterling makes getting anyone except Salah easy. It costs me 0.2m. I feel it is probably worth the 0.2m for the extra points from Hazard. Getting him back is easy on FH32 and then WC34. #1 in the world is still in LMS. Looks like he will make the final 240 or so too. That takes time. You could have just told me. Lol. I don't even know what a stickie is. You can sort by sticky, date or rating up the top. First time ever. Thanks Tm. Finally made it to the big time. -So anything extra is for a hit! Hazard is creeping up. They may both rise tomorrow. Same feeling s cheers !!! I am keeping sterling benching him. Are most people selling him on here? Selling for Mane after he rises. Hoping so. Depending on how Mane looks I’m likely doing Sterling to Mane, but would like to pocket some change if possible. Just missed out on price change some I'm .1 off Pogba > Hazard. Are people generally binning Pogba and Rashford now so they can field teams in 31 + 33 (assuming FH32)? Also, is -8 worth it to field an 11 in 31 and have good options in 33. Sorry about all the questions... first year playing so I've not seen this business end of the season before! Pretty much. Pogba being kept by most if possible. Dendoncker + Rashford to Fraser and Wilson (keep Pog and don't have to pay .4 or more if I want him back in later). Hazard vs Fraser for 31/33. Pogba likely to drop another time. Showing your age too much. Only own TAA and Salah so a Mane fail is fine. Night all. Going to dream of a Mane hat trick tomorrow. You won't. You're addicted now. Saw that earlier. Utterly baffling and stupid decision from WBA, and a real shame for Darren Moore. Fans aren’t happy about it either. First solidly good week in a while and a green arrow, and only thanks to Vardy and Sterling(c). Sterling captain certainly took the sting off of playing Fab and Fanny over Boruc and Camarasa! How you all doing so far? Similar score to you this gameweek - salahless team for me. But miles off you in terms of consistency and points! Nice one, and must’ve been a nice last few weeks without salah! Could be tricky tomorrow though. Good luck! You've gone the opposite direction to me completely in the last few weeks. I dunno how that happened!? Bad transfers, Higuian should really have been Vardy in hindsight. Holding to many duds and didn't play the DGW well. Yeah, glad sterling came good! Sterling (c) and Vardy 58 of those!! Doing pretty good, captained Vardy over Sterling though who was my vice. Under average but lots to go. Envious of the Sterling C’ers. Knew we shouldn't have captained Vardy, stitched tongue freak. Haha, yeah, but we are lucky that both delivered! If Vardy blanked after switching the armband off Sterling yesterday it would have hurt a lot! Wow! Nice one! Must be a massive rank boost. 9k to 3k so pretty big! Possible he could get a few assists. But Burnley will be battling hard after Cardiff's result on Saturday. Just about. Maybe leave the Son bit until just before deadline as you’ll probably know if he plays 33 or not. Ageuro owners.. keeping or selling through GW31? Bought him at 11.6m. Tempted to sell just cos of the extra cash that gives..
Planning about 4 transfers this GW (2ft's) and kind of need more flexibility. Have Vardy already at least. Prob going for Higuain + Rash to Wilson too. Sell if you still got chips. Probably keep if not. Weighing up whether FH or TC in 32. What looks best? Only differentials posted. B: (FH in use. Would WC34, BB35, TC36). My 31/33 would be a strong XI though. For free in 31 and a hit in 33. Being rigid with the players in A though, over a good few weeks would probably mean more hits as it’s so long to get through. Just inside the top 10k but no Hazard and no Mané tomorrow. Plus my captain already played (Aguero). Wish me luck, it will be a sunday of hiding behind the sofa since three big hitters can kill my rank. To field 10 for 31. FH 32. All chips intact. Looks good. Which big hitter won't you have on GW31 ? Only one I won't have is a 2nd Pool defender. You'll have Salah, Hazard, Mané and Higuain ? That's good. That would be nice but extremely hard to get. Who is another striker? Jimenez? Or you still keep Pogba? Rashford and Pogba ill be keeping. Sorry stupid question, but if i use my free hit chip for the upcoming gameweek today. Will i be able to make transfers throughout the week up until deadline similar to the wildcard? How does this look for BGW31 ? Already took a -4. Do you think an additionnal -4 is required to bring a goalie ? Do you think Boruc deserves a -4 ? I could still bring a goalie for GW33 so it will be really just for 31. He'll need to get at least 4 pts to make it even. So basically a cleanie for BOU or the transfer is a fail. Really hesitating. He got 6 points against city last week despite conceding! CS this week too. No. If he gets 2 pts, it's a -2 for me. Could bring any goalie for free in GW33 and field 11 players. Just discovered I can do Kane > Calvert-Lewin & then Hayden > Sterling next week b4 Free Hit. Tasty! Am I completely misunderstanding this? Which GW are you FHing? 32. can't i sneak a transfer in first no? FH cancels all transfers for that week. makes no differences but ok, good to know. I thought I could use my 32 transfer before I free hit, so i'll get sterling in 33 now instead. hmmm yes that's true. come on calvert lewin! Will watch closely how both look tomorrow, but kinda tempted to keep Sterling and do Doherty to TAA.... hmm. Was all set on Sterling to Mane. I'm doing Sterling to Mane, currently have TAA and Salah. Got Fraser first on my bench with 10 points (stuck with him since GW 6). Robertson, TAA, Salah, Pogba, Barnes and Jiminez still to play. Is a nice TAA benching the best I can hope for? So far have 9, will take two hits. who else would you get? Congratulations to all sterling cappers! That's massive and I wished I followed through my gut in captaining him but backed out in fear of Aguero. Huge question this week is Vardy or Higuain!!? To transfer in or captain? I did the same but at least we owned him, many do not. I have funds for either of those + Hazard so that's fine. I guess vardy it is then! Anybody else think Pickford is overrated, yes I know he saved a penalty but he seems to have so many mistakes in him it’s laughable. Hope Heaton gets a chance for England has a much cooler head. Maybe he’s to young, maybe he’s been made to think he’s better than he is. And what was he doing start of the second half with the Newcastle fans. Seem like another joe hart. Totally agree he is not as good as Heaton, makes far too many irrational decisions under pressure. Shame as he was good at Sunderland, could it be a case of to much pressure at a young age? Well he was rewarded with 5 FPL points because he made a horrible mistake and rugby tackled Rondon. He should've at least been YCed for it. As an Aussie I think Heaton or Pope should be the England keeper. Heaton is a great keeper. He is criminally underrated because he plays for an unfashionable club.